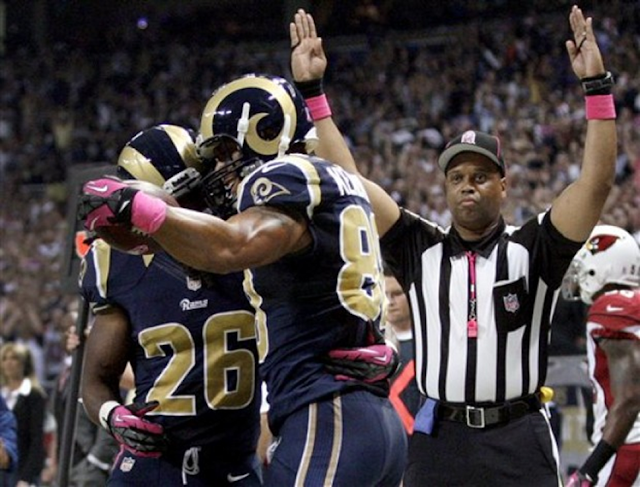 St. Louis Rams tight end Lance Kendricks is congratulated by Daryl Richardson, left, after catching a 7-yard pass for a touchdown during the first quarter of an NFL football game against the Arizona Cardinals, Thursday, Oct. 4, 2012, in St. Louis. After catching a 7-yard touchdown pass from Sam Bradford, tight end Lance Kendricks gave a matter-of-fact hug to running back Daryl Richardson and center Robert Turner in the end zone. End of celebration. In short, Kendricks acted like he'd been there before. Actually, he has, but he hasn't. In two preseasons with the Rams, the 2011 second-round pick has scored four TDs. But his grab against Arizona marked his first touchdown in the regular season. "Long time coming, but hopefully there's a lot more," Kendricks said. In some ways, Kendricks has been a victim of his stellar rookie preseason, when he led the Rams in catches (11), yards (155), and TD catches (three). He made it look easy that August and looked like a star in the making. But once the regular season started, he had some costly drops, a couple of which would have resulted in touchdowns. For a while, it looked like he might have lost some confidence. But then in Game 5, in Green Bay, he caught four passes for 71 yards, including a long of 45 yards. Although lost in the din of a fifth straight loss, Bradford's high-ankle sprain, and even the Cardinals-Brewers baseball playoff series, it looked like Kendricks might be settling in as a pass-catching threat. But the very next day, the Rams traded for wide receiver Brandon Lloyd, and that meant fewer pass-catching opportunities for everybody. Over the final 11 games of 2011, Lloyd was targeted nearly 11 times a game. Kendricks went from being targeted 5½ times a game before the Lloyd trade to just 3.2 times a game. Factored in as well around midseason was that Kendricks missed one game entirely and was slowed in a few others by a mid-foot sprain. Long story short — fans, media, and coaches never got to see if Kendricks could approach that preseason form. "It was the kind of adversity you go through in a season," Kendricks said. "We were losing games, and things got almost desperate if you want to say it. But you keep learning and you keep trying to pick the brains of those around you. "You keep trying to work on your technique. You try to get better as a player. Even though the stats aren't showing up on the board, you can still run a good route, you can still pass block, whatever." Chalk it up to experience, or lack thereof, as a rookie. "I think I definitely learned a lot," Kendricks said. "I think I had a lot on my shoulders. A lot I wasn't able to overcome, but I tried to control what I could do. And I just tried to play as hard as I could for the time that I was on the field." During the offseason, Kendricks worked on getting yards after the catch. During the six-week break between the spring practice period and the start of training camp, he also worked on his conditioning, endurance and focus back home in Milwaukee with something called "hot yoga." It's yoga done indoors with the thermostat turned up to 90 degrees. "Ninety degrees for 90 minutes," Kendricks said. "It's a big room with a lot of people in it, so it gets real hot. So you do the poses and try to stay in there. It's supposed to cleanse you, and when you come out you're supposed to feel more refreshed and more focused and all that good stuff." He did it twice a week, with a group that included lots of college students and mothers. "I kind of just tried it on my own," he said. "I read a couple articles about it. And I learned other players and other athletes did it. They were less injury-prone and more flexible." Kendricks started 2012 with a solid preseason (five catches for 78 yards and TD). Once the regular season hit, he dropped a couple of catchable balls against Chicago, as well as one against Arizona. But they were all shorter passes and weren't drive-stoppers or TD-killers. "The one where I kind of back-shouldered it (against Arizona), nine times out of 10 I make that catch," Kendricks said. "It's kind of frustrating, but it's like, you know, move on. Move on and play the next play." Otherwise, Kendricks has caught just about everything thrown his way. He has been targeted only 15 times so far this season but has 10 catches, the third-highest total on the team behind Danny Amendola's 32 receptions and Brandon Gibson's 13. The Rams would like to see Kendricks improve on his "out-of-frame" catching — balls where he has to reach out for the football. But otherwise there are no complaints. "He's been playing very well," coach Jeff Fisher said. "His blocking, I think that goes unnoticed. But I was happy that he was able to make that (touchdown) catch. He made a big catch for us (against Seattle) to keep a drive alive down the middle part of the field, so he's coming on. Rob (Boras) is working with him, doing a good job with him. It's hard to take him off the field because of his ability." Boras is the Rams' tight ends coach. Kendricks has participated in about 85 percent of the team's offensive snaps this season. In three of the Rams' five games, only the starting offensive linemen and quarterback — who almost never leave the game barring injury — have played more snaps on offense. Because of the injury situation on the offensive line and protection issues, Kendricks has stayed in to block on numerous pass plays. Would he like to get the ball more? "Who doesn't?" Kendricks said. "It'll come. We've got a ton of season left. I'm not worried about that." And with the injured Amendola out for a month or two, Kendricks could help pick up the slack.